SCOTT AFB – Poor oral health and tooth decay can cause discomfort and result in young students having difficulty participating or concentrating in school. Nearly 40 percent of children in Illinois have had a cavity in the past year, and about one in five kids in Illinois has untreated tooth decay.1 To help kids learn about the importance of good oral health and how to fight decay, Tooth Wizard and PlaqueMan, characters from the Delta Dental of Illinois Foundation’s Land of Smiles program, visited students at Scott Elementary School on Oct. 18. 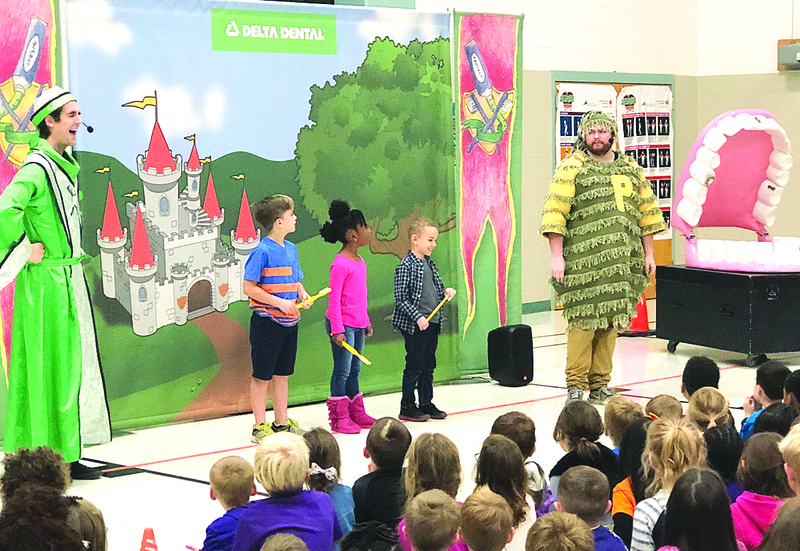 Scott Elementary students began their oral health journey by helping the heroic Tooth Wizard defeat his arch nemesis, PlaqueMan, by learning the habits needed to have healthy smiles and bodies. Children got involved in the fun during the interactive performance, helping demonstrate how to correctly brush, floss and use fluoride rinse, which caused PlaqueMan to scurry off the stage in defeat. The free Land of Smiles program also taught children the importance of eating smile-friendly foods, visiting the dentist regularly and having sealants applied. In addition to the oral health lesson, children who participated in Land of Smiles received an oral health kit with a toothbrush, toothpaste, floss and a booklet packed with oral health tips. The school also received a curriculum kit to help educators reinforce good oral health habits with students throughout the year. In 2018, the Land of Smiles program will reach nearly 38,000 pre-kindergarten through third-grade students in nearly 175 Illinois elementary schools throughout the state. The program has reached over 330,000 students at more than 800 Illinois schools in the past 10 years. For those interested in requesting a Land of Smiles appearance at their school, visit landofsmilesil.org. About Delta Dental of Illinois Foundation – 0The Delta Dental of Illinois Foundation was formed in March 2008 by Delta Dental of Illinois, a not-for-profit dental service corporation with a mission to improve the oral health of the communities it serves. Delta Dental of Illinois Foundation is the 501(c)(3) charitable arm of Delta Dental of Illinois and works to support and improve the oral health of people in Illinois. In the past decade, combined efforts of Delta Dental of Illinois and Delta Dental of Illinois Foundation have provided more than $5 million to programs in Illinois that improve the oral health of the residents.